Charming old world details come together to make this pierced and engraved antique engagement ring a visually spectacular one. The platinum band of this antique ring is carved down the shoulders in a combination of chevrons and feathers. Four old style full cut diamonds are tucked into the pierced mounting. Ascending from the center is a GIA-certified old European cut diamond that is K in color and VVS2 in clarity. This diamond weighs 0.79 carats. The total diamond weight of this antique engagement ring is 0.94 carats. Circa 1920. 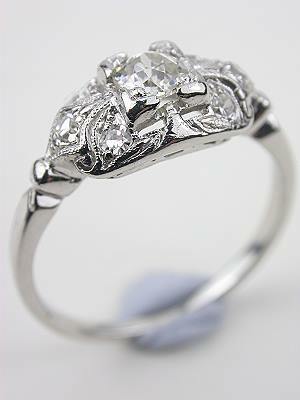 This pierced antique engagement ring with diamond has a matching antique band! Set in 18k white gold, the wedding band of this set is carved in a wheat and bead pattern. The matching antique engagement ring is ornately pierced at the shank and shoulders. The tiered mounting lends geometric intrigue with a lozenge nestled inside a pair of octagons. Cradled at the center is an old European cut diamond. This antique bridal ring set is circa 1920. This bridal set requires a custom sizing quote. Thin ribbons of platinum wrap this antique engagement ring in an intriguing metallic web. Like delicately spun silk ribbons, the "ribbons" in this antique engagement ring intertwine to cusp an old European cut diamond at their center. Rated K in color and SI2 in clarity, this blissful diamond solitaire weighs 0.54 carats. 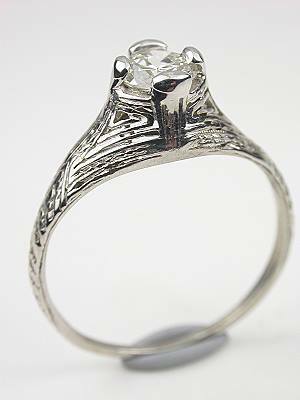 The band of this antique engagement ring is made of platinum and is etched at the shoulders in a chevron design. Circa 1925. Like a beautiful ice sculpture, this old European cut diamond antique engagement ring shimmers on the finger. An antique engagement ring with a platinum band is carved at the shoulders in an hourglass design. Elevated slightly in the middle of the mounting is an old European cut diamond. This I-colored, VS1-clarity old cut diamond weighs 0.23 carats. Six single cut diamonds seem to float around the center stone. Circa 1930. 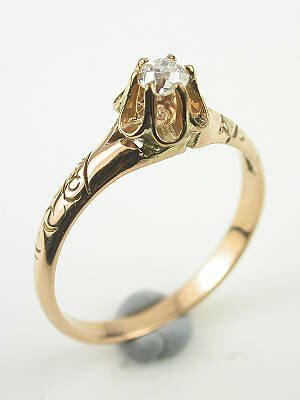 Romance comes in small packages with this hand wrought antique Victorian engagement ring. Delicately flirty, the 14k rose gold band of this Victorian engagement ring is carved in a scrolling curlicue design. The buttercup head holds an old European cut diamond in its pronged petals. This old cut diamond centerpiece weighs 0.15 carats. Circa 1885. 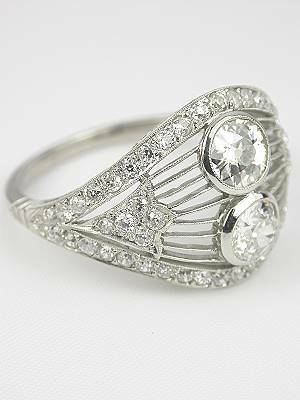 Like delicate butterfly wings, this Art Deco antique filigree engagement ring flutters around the finger. 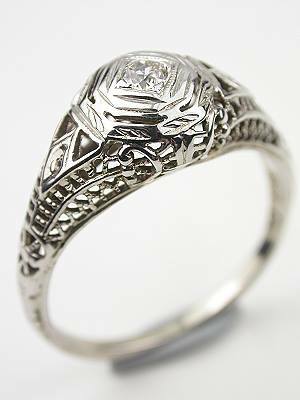 The domed platinum mounting of this antique ring is delightful with its pierced filigree. A collection of eighteen old style single cut and round full cut diamonds, along with a quartet of rectangular French and mixed faceted cut blue sapphires, accentuates the filigree. Rising out of the center of the dome is a round brilliant cut diamond. Weighing 1.12 carats, this GIA certified center diamond is I in color and SI2 in clarity. 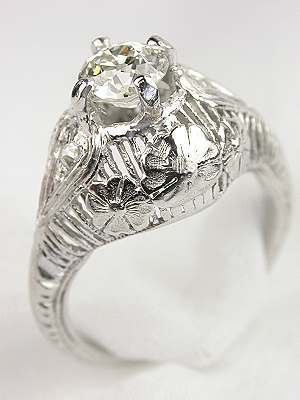 The total diamond weight of this Art Deco engagement ring is 1.365 carats. From the Topazery Tara Collection. Circa 1920s. In this stylish Edwardian antique engagement ring, the finger is wrapped in shining threads. Like gleaming droplets in a delicate web, twin moons of diamond float on platinum strings in this Edwardian antique engagement ring. The fabulous mounting shows off 2 bezel set old European cut diamonds. The total diamond weight in this antique engagement ring is 1.88 carats. Circa 1910. 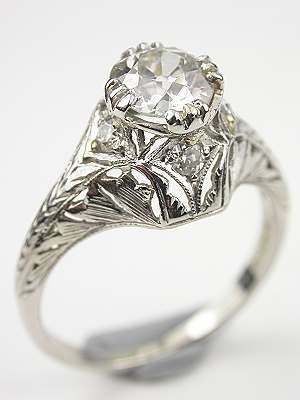 The raised dome setting of this Edwardian antique filigree diamond engagement ring is highlighted by a floral design. The iridium-platinum setting of this antique engagement ring combines floral filigree cutwork and open-weave carving for a visually stunning display. 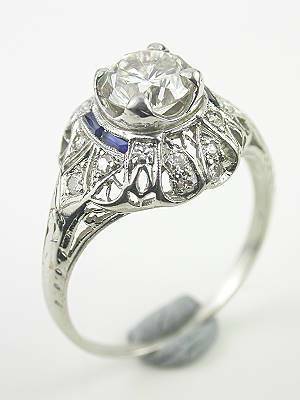 An old European cut diamond is set at the top of this Edwardian engagement ring's dome. This J colored, SI1 clarity diamond weighs 0.468 carats. Two round single cut diamonds flank the center stone for a total diamond weight of 0.488 carats. Circa 1915.